Cade McNown became the starting quarterback at UCLA as a true freshman, four games into the season, ranking first among all freshmen quarterbacks in many statistics. For his career, McNown still holds many of the passing and total-offense records. McNown also holds the distinction of being the only UCLA quarterback to go 4-0 against cross-town rival USC. On October 9, 2009, McNown was inducted into the UCLA Athletics Hall of Fame. 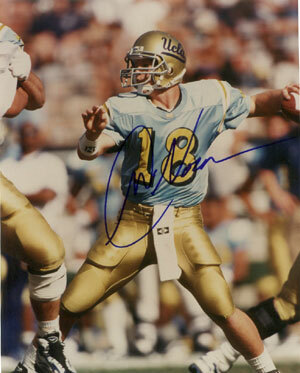 Cade McNown has hand autographed this UCLA Bruins 8x10 Color Photo. Certificate of Authenticity from Athlon Sports. This product was added to our catalog on Friday 16 July, 2004.